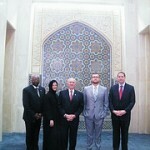 We had a busy day full of meetings with government and civic leaders in Kuwait today. We started out with a visit to the Grand Mosque where our tour guide explained Islam and we got to view this amazing place of worship (check out the photos on the Flickr set). From there we headed to the National Assembly where we learned about the Kuwaiti parliamentary system and met with Dr. Aseel Al-Awadi one of the first four women elected to the Kuwait parliament in 2009. Dr. Al-Awadi and her staff discussed with us her campaign and surprise election in 2009 when she successfully tapped into the youth vote through the use of social media and technology tools. Dr. Al-Awadi continues to engage her constituents through the use of Twitter and YouTube, showing the impact these tools can have on an engaged citizenry. We also had the honor to meet the Speaker of the Kuwait National Assembly, Mr. Jassem Al-Kharafi. Mr. Al-Kharafi was very gracious with his time and discussed the current political situation in the Gulf region with the delegation. Congressman Martin Lancaster recounted his first trip to Kuwait 20 years ago (when serving in Congress) directly following the first Gulf War. After a traditional lunch we spent some time shopping in the old souk (market) before heading to the Kuwait Science Club. The Club is a nonprofit organization that provides opportunities for youth to learn a variety of topics – from automotive repair, to chemistry, even astronomy. The after school classes are taught on the large Club campus by a group of volunteers and provides multiple opportunities for Kuwaiti youth to explore additional learning and extracurricular activities. It was interesting to see the way this organization utilized volunteers and provided programming for youth in the area. We ended our day by attending two different dewaniya gatherings, a meeting with community members to discuss politics and social life in Kuwait. The first dewaniya was with an older well connected family and had many prominent business and government leaders, including a sitting member of Parliament. The second dewaniya was mostly younger men, many of whom were educated in the United States. 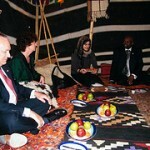 The discussions in both varied, ranging from US politics in the Gulf – to use of social media and technology. Besides the specific discussions the most striking thing was the fact that there is a structured and frequent opportunity for this type of dialogue to take place. All the US delegates were struck by the active level of engagement and knowledge taking place and thought it would be beneficial if such discussions where happening in the US – a time where people could discuss issues of the day in a constructive space and learn from each other.